Real estate cycle expert Bryan Kavanagh says turnover and price declines in Sydney and Melbourne during 2018 indicate an economic recession in the 2019-20 financial year. 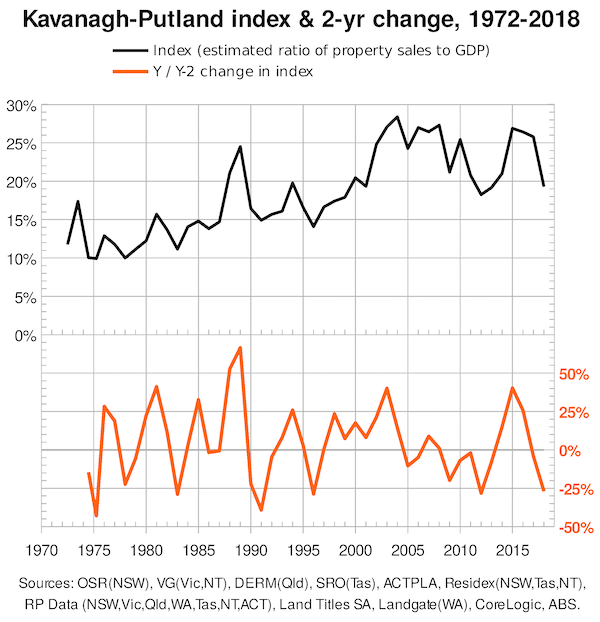 The 2018 “Kavanagh-Putland Index”, released today, shows the total value of Australian real estate sales to GDP. Mr Kavanagh said the $50 billion pumped into markets by the Rudd-Swan government in 2008-09 to forestall the 2008 real estate bubble-burst of the USA and Europe “had simply kicked the can down the road for a greater financial correction”. “Australians have been doing what the tax system has encouraged them to do: to invest in real estate, because their increase in real estate wealth tends to dwarf the wages they’re able to earn”, Mr Kavanagh said. “Billions will be lost, including in superannuation, because we inflated a gigantic real estate bubble to which our political leaders closed their eyes”, Kavanagh stated.